Too old to be used by God? Not for a collection of sewing machines! 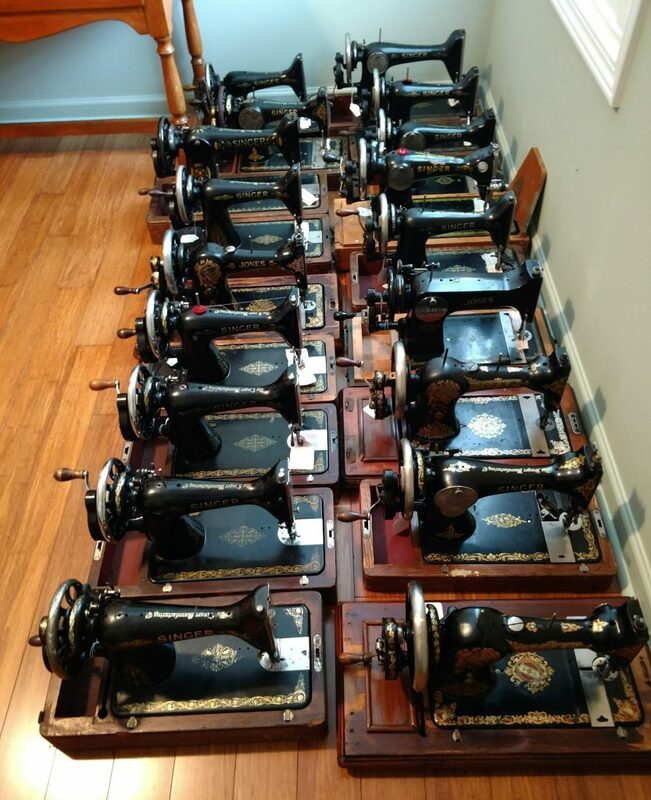 The old Singer sewing machines were accidentally shipped from Europe to a business in Sanford, Florida. 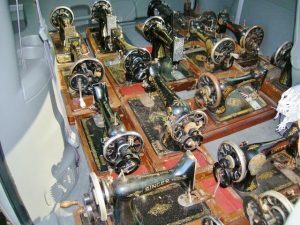 Although the shop owners specialized in re-purposed antique wood and industrial antique machinery, they didn’t have a specific use for the sewing machines, and left five of them sitting out on the showroom floor. That could have been the end of the story. Yet Bill and Dottie Jones, partners with Missionary Ventures, had prayed for a sewing ministry in Sierra Leone, where they have visited for seven years. They had equipped several locals to carry on the ministry between visits, specifically Mary Gomeh, whom they communicated with regularly. And while those sewing machines sat on the showroom floor, Bill’s nephew, Prem, and Dottie’s brother, Neil Aly (former MVI volunteer) came to look at reclaimed wood for new kitchen countertops. They asked about the sewing machines, and found that the business had several, but all were in various states of disrepair. Hand crank sewing machines on their way to be repaired. As only the Lord could ordain it, Bill has a talent for restoring old machines, and within a few months he had restored 34 sewing machines. These are perfect for Africa. Each one is hand crank, and easy to operate with surprising speed and accuracy. They don’t require electricity or a treadle, so they are totally portable. They were made over 100 years ago, but they were designed to be repaired instead of replaced. Now they will soon be on their way to Lunsar, Sierra Leone, where Mary has prepared classrooms and teachers for the new sewing ministry. There have been several graduates already with other machines, and this will allow the ministry to expand exponentially! Mary equipped with motorbike from MVI. 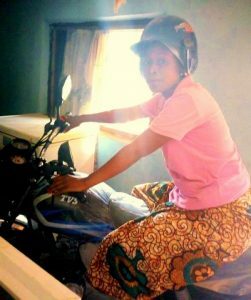 Missionary Ventures has also equipped Mary with a motorbike to use in showing the JESUS film to women and delivering some of the hand crank machines to homes and secondary schools in villages. “Her attitude is combination of surprise, joy, gratitude, and complete obedience to the ministry God has prepared her to do,” Bill and Dottie explained. Please pray for Bill and Dottie as they make their sixth visit to Lunsar in June, and for Mary, the sewing ministry, and the machines that will soon be on their way to Africa. What someone had abandoned, God is giving new life! Repaired machines, ready to be sent to Africa. 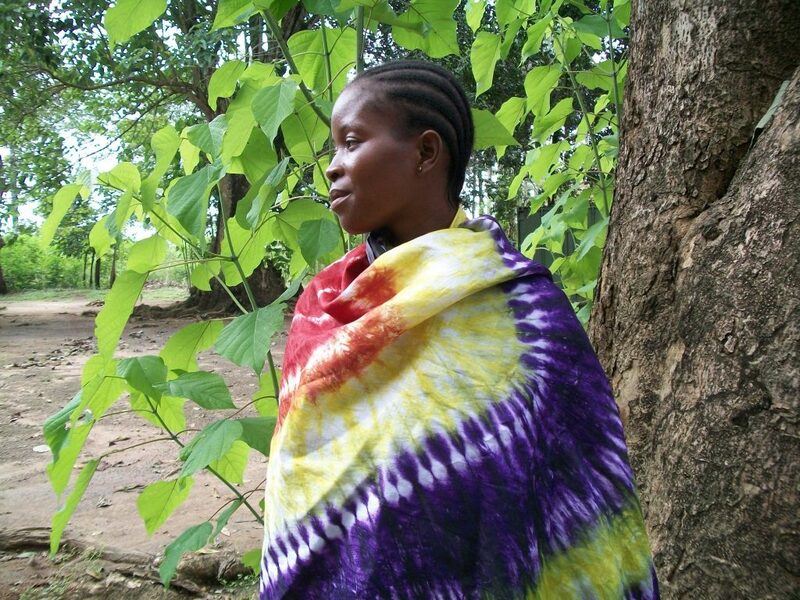 Mary, wearing cloth she made and dyed herself. Dying of Hunger No More!